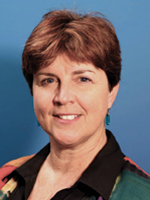 Cyndy Scheibe is the Executive Director and Founder of Project Look Sharp, one of the leading media literacy organizations serving K-12 and college educators in the U.S. and a pioneer of curriculum-driven media literacy education. She is also an associate professor in developmental psychology at Ithaca College where she has taught courses in developmental psychology, media research, and media literacy for more than 25 years, and serves as the Director of the Center for Research on the Effects of Television Lab and Archive. A dynamic speaker and workshop leader, she was a founding board member of the National Association for Media Literacy Education, and is author of several articles on media literacy education and practice. She is a contributing editor to many of the media literacy curriculum kits developed by Project Look Sharp, and co-author of the Critical Thinking and Health kit series based on media literacy for elementary grades. She received her Ph.D. in Human Development (1987) from Cornell University.